It is the real crystal of science that represents a motorcycle technology of this age by a machine designed on the basis of high feedback and perfect control performance in order to react and accommodate riders’ ideas and feeling in the most sensitive way. 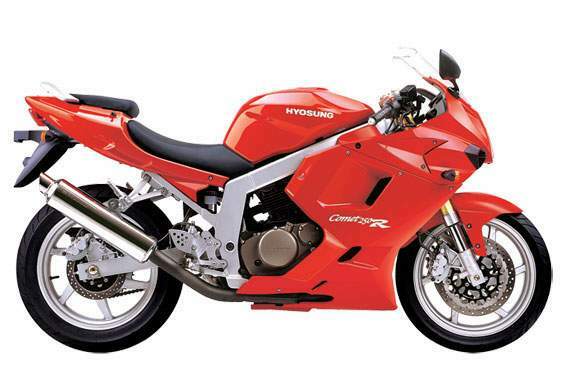 The Hyosung V-twin 250cc engine was designed in Hamamatsu Japan by a design team consisting of engineers who have previously worked in the R&D teams of some of the big Japanese motorcycle companies. Because this engine is the newest design among its rivals, it has many performance features that they do not have. These include roller bearing cam shafts, 2 piece spring dampened bevel silent primary drive gears, dual squelsh combustion chambers etc. These are features that were previously confined to racing engines, and in the past have been uneconomical for other manufacturers to incorporate into smaller capacity engines for street use. Proven DOHC 8 valve engine configuration, with twin downdraft Mikuni carburetors provide the highest volumetric efficiency and air cooling coupled with an oil cooler provide reliability in the harshest conditions. The latest sport bike styling is incorporated into a practical design. Note the pillion seat and heavy duty pillion grabrail with 3 tie down points for your gear for those long trips. The rider’s seat is firm in design to provide good support and reduce fatigue. Heavy duty rear disc brakes with twin piston fully floating caliper, six spoke alloy wheels with wide tubeless tyres and free flowing exhaust system are used to give maximum performance. A low cost racing muffler is also available if additional engine output is required. Huge twin front disc brakes with dual twin piston calipers provide amazing stopping power. Large 41mm inverted front forks provide superb handling by working in tune with the gas charged rear shock absorber. Dual lens headlamp and aerodynamic fairing are stylish and functional. A tinted windscreen is available as an optional extra. Race position handlebars and adjustable footrest positions give the rider flexibility to tailor the ride position to rider preference. Ready to race, ready to ride. 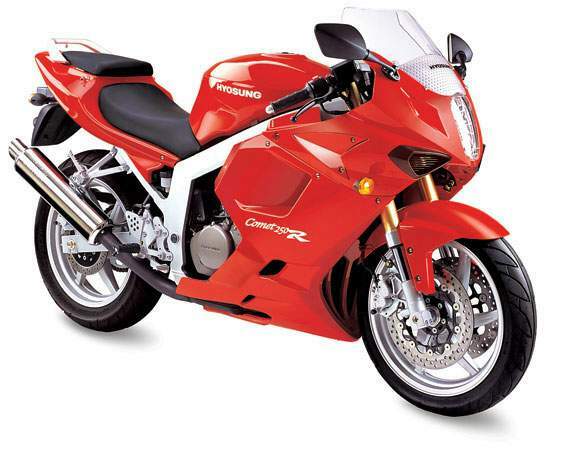 The GT250R is a full size race tuned bike with looks to match. Fully equipped with rollerized V-Twin high output DOHC 8 valve engine, race tuned suspension including inverted forks and gas charged shock absorber, huge brakes, stunning aerodynamics, complimented by digital instruments and adjustable ride position. Whether you’re starting a race career, riding for fun or just getting around, the GT250R is ready to take you where ever you want to go.